I’ve recently fallen in love with podcasts (my cell phone data bill doesn’t quite agree with me, but w/e) and I’ve gotten to the point where I don’t just listen to them on the drive to/from work… but when I’m spraying for weeds in the backyard and waiting for my nails to dry too lol. Kind of like books, I really like podcasts because they let you see the perspective of someone else and almost always teach you something. Big bonus: they’re all freeeeeee. While I probably learn a bit more from TED Radio Hour than I do from the LadyGang podcast…. it’s a different kind of learning haha. I put together a list of my favorite 5 podcasts I subscribe to in the iTunes Podcast app and hope you love them as much as I do! I came across the Alison Show a few months ago when one of my co-workers tagged me in one of her Instagram dance videos lol. She started her podcast Awesome With Alison at the beginning of this year and her and her husband are hilarious on it. Alison has such a fun and bubbly personality and offers a tip of advice each episode to help you feel awesome. Plus, they share funny stories about their daily lives and their kids so it’s pretty entertaining. While this podcast is a little more R-rated than Awesome with Alison lol, it’s hosted by Lauren from The Skinny Confidential and her husband. It goes without saying that their style is real and “unfiltered”, so be prepared! They typically interview someone each podcast with topics ranging from business to blending families to bikini waxes and more. While this podcast is definitely the most intellectual of the list, TED breaks down TED talks into hour-long, digestible segments. They cover topics from city-planning to communicating via text messages and I always feel a bit more in-the-know after listening to a TED Radio Hour. Who hasn’t read the #GirlBoss book yet?! 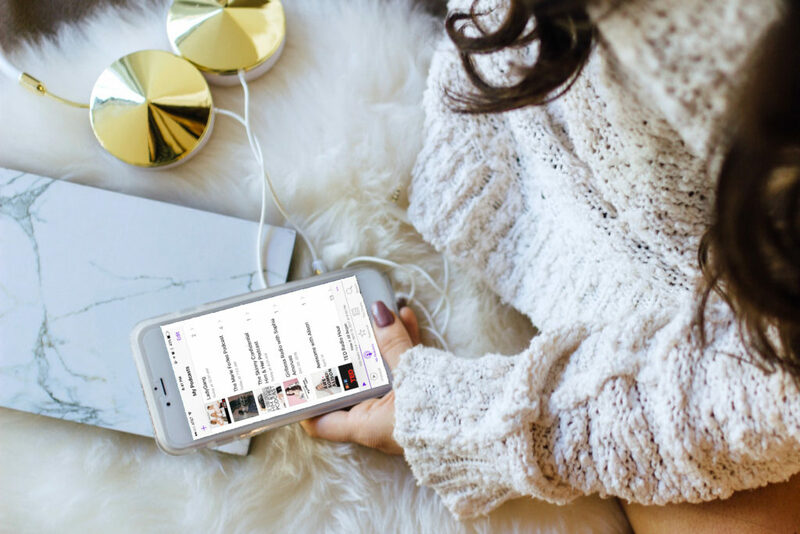 Sophia Amoruso made her content into a podcast too, but ever since launching GirlBoss TV on Netflix she has yet to release a new podcast episode. I love that she is so sassy and is pretty blunt about life, goals, and business. She interviews people killing it in their industry and asks them for advice and how they got there. Even though she doesn’t make new ones any more, she has a library of like 50+ podcasts that will definitely help you kill some of that commute time. I’m honestly mad that I didn’t discover this podcast sooner lol. I learned about the LadyGang on the Him & Her Podcast and quickly fell in love. It’s hosted by 3 B-list celebs (I don’t mean that in a bad way — they’re all hilarious and very entertaining) and use their experience trying to make it big in Hollywood to tell some pretty funny stories. They interview someone each week (who’s also somehow in the spotlight) and discuss things from breakup advice, to hair extensions, to marriage and more.